Updated, Nov. 28: More than three weeks after Election Day, Democrat T.J. Cox claimed an upset victory on Nov. 28 in California’s 21st congressional district. Cox came from behind to apparently defeat three-term GOP incumbent David Valadao by more than 520 votes with more votes to be counted in counties where trends favored Cox. The win takes Democrats to a 40-seat gain in the House of Representatives and a seven-seat loss for California Republicans. Cox’s victory leaves the GOP occupying only seven House seats now out of 53 held by Californians. President Trump’s harsh rhetoric and actions on immigration are a big issue in the district. Bryan Osorio, who graduated from UC Berkeley last spring, won a surprise election to the Delano City Council in the 21st district with a campaign vowing to defend immigrant families. 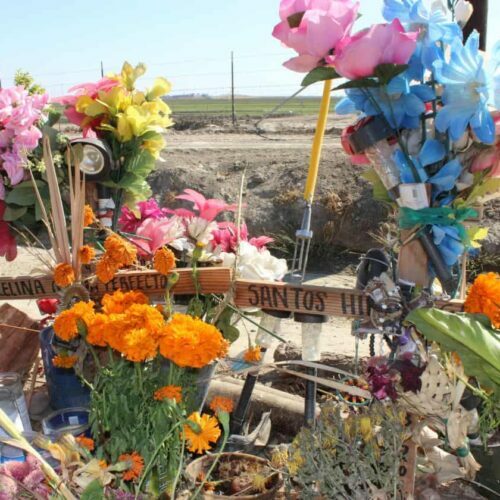 DELANO, Calif. — A small shrine with fresh marigolds and votive candles marks the spot where immigrants Marcelina and Santos Garcia were killed on March 13. The couple, of Mixtec Indian origin, had emigrated to California’s Central Valley from a rural region in Mexico where family values are strong. 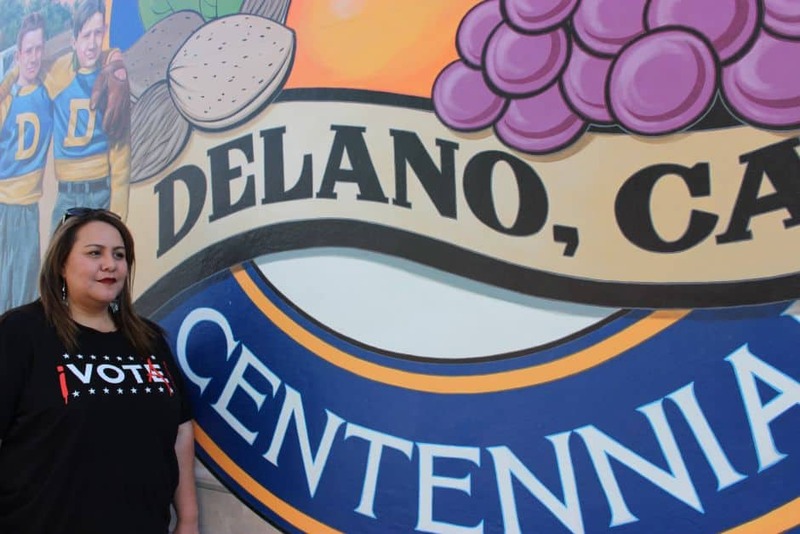 Like so many other immigrants, they built a life in Delano, a city of 53,000 that’s about 140 miles north of Los Angeles. There, they worked in the world’s most productive farm industry, in its vast sea of grape vines, fruit trees and multi-seasonal crops. But early that March morning, as the Garcias drove through town, U.S. Immigration and Customs Enforcement agents closed in on their SUV. 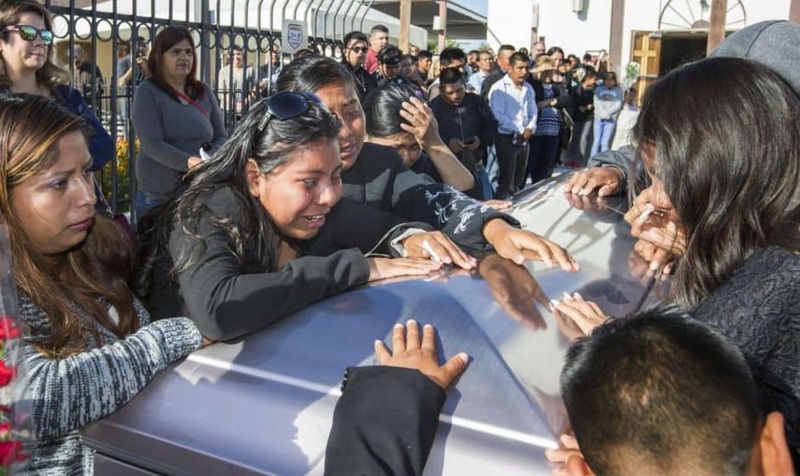 The Garcias’ deaths left their six children, who are not all U.S. citizens, orphaned. And in Delano — where in 1965 the United Farm Workers first carved their place in history — anger and fear about what happened has added urgency and upped the stakes for the midterm election occurring Tuesday. But do others agree? 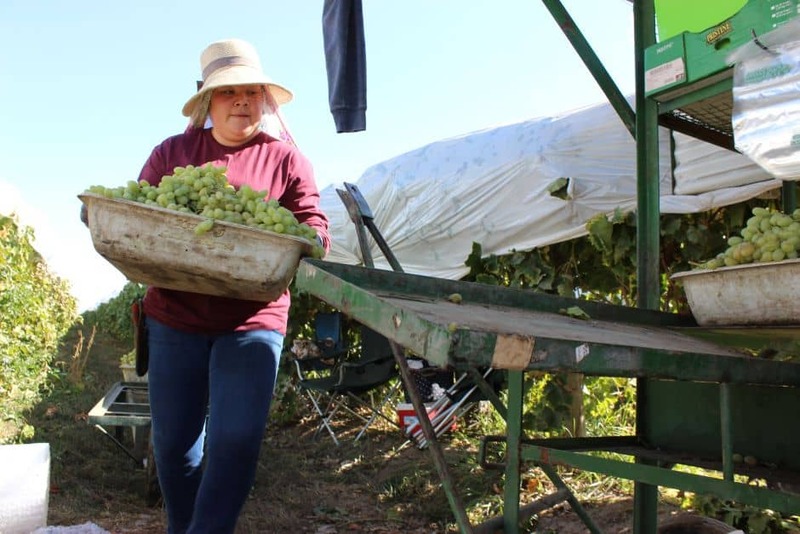 Hernandez and a lot of young Latinos like her — many motivated, some less so — could be pivotal to what happens in this grape-growing region with a disappointing history of voter turnout. That history explains why get-out-the-vote campaigns hoping to energize thousands of voters have been sweeping through California’s Central Valley in recent weeks, as labor groups and immigrant rights activists aim to send a message to President Donald J. Trump. In the eye of the storm: the district’s congressman, U.S. Rep. David Valadao, a Republican who has defied the odds by being elected three times in a district where Democrats hold a registration advantage and Hillary Clinton was victorious just two years ago. It took a five-year strike and a national boycott campaign for the UFW to obtain its first union contract in 1970 benefiting Mexican-American and Mexican and Filipino immigrant grape laborers. As door-to-door voter turnout campaigns tick up to Election Day, Forty Acres is a reminder that change can take root slowly. Stretching more than 150-miles northwest to southeast , the Valley district includes parts of Fresno , Kings, Tulare and Kern counties and a piece of the city of Bakersfield. The district is also home to a smattering of small cities, Naval Air Station Lemoore, a major fighter base, and mile after mile of crops and dairy farms. Interest in midterm elections is usually tepid compared to presidential races. But it’s the age of Trump, and California is a state where Latinos, mostly Mexican-American, are now the single largest demographic. Against this backdrop, Democrats hope that more door-to-door contact with “low-propensity” voters and “ticket splitters” will channel that anti-Trump sentiment into victories in at least a few GOP-held districts. If that happens, GOP California could shrink more and contribute to “flipping” the Republican-held U.S. House of Representatives to Democrats. But Valadao has not been alone in bucking the tide; neighboring conservative districts are held by House Majority Leader Kevin McCarthy and rising conservative star Devin Nunes. “We share a history as the children of immigrant parents. We don’t know if the next ICE pursuit with be for one our families,” said Bryan Osorio, 22, who grew up in Delano. He explained the personal stakes for so many here during a meeting at Delano’s sole Starbucks. The coffee shop wasn’t far from where workers, swaddled in scarfs to fend off dust, were gleaning the last of this area’s gargantuan crop of table grapes to ship back East. 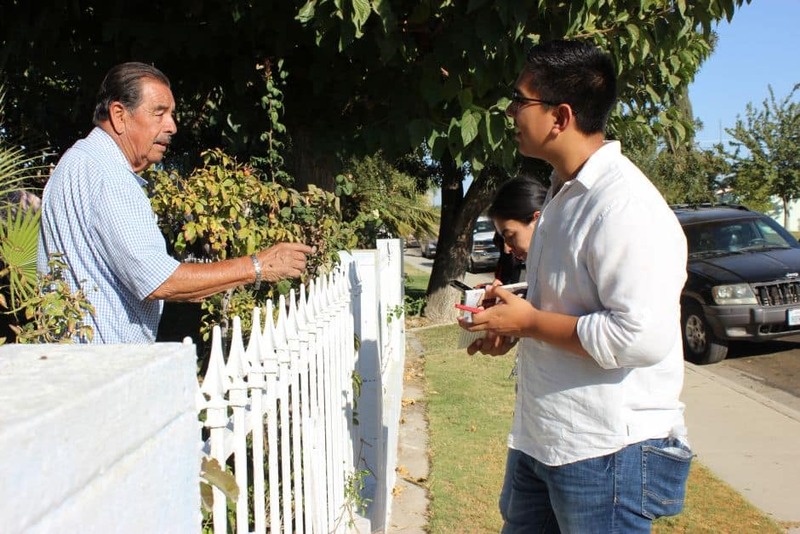 Because he’d like a leadership role in vigorously challenging Trump policies, Osorio is now running for Delano City Council. He’s also vowing to address Delano’s poor water quality and stop water rate hikes burdening low-income families here. Armed with research to help him home in on infrequent voters, the recent University of California at Berkeley graduate has been knocking on doors on the West side of Delano, the Latino barrio back when Latinos were a minority and some white-owned establishments barred Mexicans from entry. The sunbaked valley has some of the worst air pollution in the country and high rates of health problems like diabetes and asthma. Obamacare was a boon to many low-income residents here. The district chose Democrat Hillary Clinton over Trump in 2016 by more than 15 points in 2016, making it one of seven GOP-held Congressional districts where the Democrat prevailed. But even though Democrats in the 21st had an estimated 16-point registration advantage over Republicans, voters returned Valadao to Congress. A mild-mannered man, he recently posed in Arizona with President Trump, along with Nunes and McCarthy of Bakersfield, who hopes to vault from GOP majority leader to Speaker of the House if the GOP retains control. The photo op on Oct. 19 was all about irrigation water — a massive issue here. It showcased Trump signing a memo accelerating biological reviews of water systems that Central Valley farmers — and workers — hope will divert more water from California rivers bearing endangered species. Trump’s move was met here with strong approval, and there was Valadao by his side. The president’s lacerating rhetoric about Mexican immigrants has upset a lot of people, so even if they regard Valadao as moderate, Trump has further tarnished the Republican brand in California. About 62 percent of the 21stdistrict’s residents who are eligible to register to vote are Latino. It’s irksome to Cruz because it’s plain to her that the region’s agribusiness industry—America’s farm powerhouse—has benefited from people who shoulder all the risks that come with undocumented immigration. Workers have assumed the burden of paying smugglers thousands of dollars to get them over the border, so they can take back-breaking jobs they obtain by showing fake documents that employers have no obligation to authenticate. Today, it’s common for there to be no bright line between documented and undocumented in towns like Delano because there are many “mixed status” families, with some members citizens, others legal residents and still others who are undocumented, “sin papales,” without papers. On his Spanish-language website, he calls himself as an “hijo de inmigrantes,” a son of immigrants. Valadao’s website also says he supports a path to legal status for undocumented people: “This will allow millions of immigrants to come out of the shadows…and raise their families without the constant fear of deportation.” But none of Valadao’s positions have gone anywhere under GOP leadership. “We have some of the poorest congressional districts,” he said. Valadao, he added, doesn’t make “any stupid mistakes” in regard to the hot-button issue of immigration. Local chambers of commerce and the U.S. Chamber of Commerce have endorsed Valadao, because of his connections to “ag, energy and water,” as a press release said. Golespe said she thinks Trump and GOP positions on immigration are going to bring more younger voters to the polls next week. “We tell people,” he said, “that it’s a civic and Christian duty to vote.” This coming Tuesday, he’ll find out whether they’re listening.